Our ever popular Jack the Joker fundraiser continues this Sunday night in Alice O’Connor’s where the jackpot is €3,800 as on Sunday night last John David Power was drawn out of the drum and chose card number 29, which when turned was not the Joker though he did win €50. Bridget Meares and Denis Cosgrave won €25 each. As well as our group of ticket sellers tickets can be purchased from Convenience Store Ballinroad, Village Flowers, Spar, Mousies Takeaway, Minnies Bar and Crotty’s Corner Bar. On Thursday night last we played The Nire in the Western Semi Final in Dungarvan, and after a very tough game we were defeated by the narrowest of margins. Whilst defeat was our lot on the night our young team can be extremely proud of their performance as they battled bravely throughout the match despite going into the game short a number of regulars and being reduced to 14 men. We thank the players and mentors for the commitment they showed to the team. We played our first game of the Sargent Cup on Friday night last when we took on our neighbours Dungarvan in Fraher Field. In a match that raised funds for the local Sesame School it was Dungarvan who ran out deserving winners on the night. We would like to remind intending members and especially players that membership fees are now due and can be paid to Kevin Tobin or any team manager. We would ask players to make a special effort to pay their membership before returning to training to ensure they are covered by insurance. We remind all those intending to join that March 31st is the closing date to pay. Our club bingo will continue this Sunday night in the the CBS Hall with a jackpot of €1200. With the Town & Country League starting on April 15th we have a couple of challenge games organised. Saturday 26th we were due to travel to Mount Sion but the match was cancelled due to the weather. We re-arranged to play Bank Holiday Monday, so hopefully this will have gone ahead and a report will be available next week. This Friday coming, April 1st we are due to play Lismore in Lismore. We will train as usual on Friday's (when we don't have matches) and shortly we will pick up the training and go a second evening. Our Under14 football team will train as usual this week. On Sunday next they will play against near neighbours Dungarvan in their fourth game in the county championship. Our Under16 football team were due to play two games this week. They were due to play one last night Tuesday and one tonight Wednesday and the results of these games and a report will be available next week. Hopefully the lads will be after performing well. Our Under 8 team were due to travel to Carriganore on Saturday morning last to take place in a blitz. However due to bad weather this blitz had to be cancelled but will go ahead this week instead in Carriganore at the same time of 11 o clock. Training for the Under 10 and Under 13 age groups will go ahead again this Friday night as usual in the wall ball. The Under 10 team will train between 7 and 8pm and the Under 13 team will train between 8 and 9pm. All are welcome to attend. Also the Under 10 team were due to travel to the Nire on bank holiday Monday last to take on the local team. Hopefully all had a good day out. Our weekly underage training sessions on Saturday mornings from 10.30am to 11.30am are proving to be a great success and we welcome back all previous players and say a Céad Míle Fáilte to all our newcomers. Thank you to all the parents who have returned the membership forms so far and we respectfully request any outstanding forms are to be returned this Saturday to allow us to register all players with Croke Park (for insurance purposes). Hurleys, Helmets & Junior Gum Shields can be purchased from our Equipment Officer, Séan Fischer, on Saturday's and are very competitively priced. Bríd Slevin is our Child Welfare Officer. If you wish to contact Bríd regarding any matter, please pass your number onto our juvenile secretary, Audrey Hallahan (0876987388) and she will forward on to Bríd. We are delighted to welcome Bríd on board and know that she will execute her duties in a professional, confidential caring and efficient manner. This week's photo comes from 1955 and shows the throw-in for a Senior Hurling Challenge Match between Abbeyside and Blackrock of Cork in Fraher Field. In those days all the forwards and midfielders lined up for the throw-in which made for a very crowded centre area of the pitch. Abbeyside players visible include M. O'Connor, R. Ruske, D. O'Connor and D. Whelan and A. Foley who are partially hidden by Blackrock players. Our ever popular Jack the Joker fundraiser continues this Sunday night in Alice O’Connor’s where the jackpot is €3,600 as on Sunday night last John David Power was drawn out of the drum and chose card number 25, which when turned was not the Joker though he did win €50. Noah Landers and Marian and Anthony won €25 each. As well as our group of ticket sellers tickets can be purchased from Convenience Store Ballinroad, Village Flowers, Spar, Mousies Takeaway, Minnies Bar and Crotty’s Corner Bar. On Saturday last our Senior Footballers traveled to Ballymacarbery to take on The Nire in round 2 of the Phelan Cup, and at the end of an entertaining game the sides were level. TEAM: R. RYAN, C. McCARTHY, E. BERGIN, D. HENLEY, S. O’DONOVAN, S. O’HARE, D. COLLINS, C. PRUNTY, J. O’MAHONY, P. HURNEY, M. FIVES, M. MAHER, P. COLLINS, M. O’HALLORAN, E. KIELY. SUBS: K. DWANE, L. HURNEY. This Thursday night we play The Nire in the Western Semi Final in Dungarvan Club Grounds at 7:30 pm. Sesame Special Needs Preschool has been running in Dungarvan for the past 30 years. The main function of Sesame is to provide an early intervention service for Children with additional needs. Children attend Sesame from Co. Waterford. In Sesame we provide a positive and safe learning environment for Children. We are funded by the HSE Disability Service. At present 20 Children attend Sesame on a weekly basis. Applications are accepted through the HSE West Waterford Early Intervention team (WWEI). Children can access the service on reaching 2 years of age. Sesame is supported by the HSE Early Intervention Team and Children access therapies such as occupational therapy, speech & language, psychology and physio as needed in the service. As a team we carry reflective practice through observations, assessments, reports, team meetings and family interventions. Throughout the day we provide opportunities for choice, turn taking, creative imagination and individualism. In July 2014 Sesame moved to its new premises at White Strand, Abbeyside. This move has afforded the service the opportunity to grow and has seen the service increase to a greater number of families. We are looking to fund raise for an outdoor specialised playground and we cannot emphasise the benefits of outdoor play for children with additional needs. Playing outside, whether it’s directed play or independent play, offers significant physical and social benefits to children with special needs.. Regular outdoor play helps children to improve body awareness, motor skills, and balance. This outdoor playground would be a very valuable resource to our children. Contact details for Sesame are sesamepreschool@cablesurf.com and 058-40001. The Management, Staff and Families of Sesame would like to take this opportunity to thank Dungarvan GAA Club and Abbeyside/Ballinacourty GAA Club and their Senior Hurling Teams & supporters for suggesting this charity event on our behalf. On behalf of all in the club we would like to congratulate Eoin Enright and Sarah O’Brien who were married last Friday. We wish them every happiness in their lives together. We would also like to congratulate Gary Hurney and Tammy Hehir on their engagement last weekend. Our club bingo will continue this Sunday night in the the CBS Hall with a jackpot of €1150. Training for the Under 10 and Under 13 age groups will go ahead again this Friday night as usual in the wall ball. The Under 10 team will train between 7 and 8 pm and the Under 13 team will train between 8 and 9 pm. All are welcome to attend. Our Under14 football team played their third match of the championship on Sunday morning last against the Nire. The team played very well on the day and came away with victory. Training for this group of players continues weekly on Monday and Thursday nights. Also on Sunday morning last our minor football team played their third match of the championship at home to Rathgormack. After another good display by the team over the hour the team won this game also and remain unbeaten so far in the championship. Well done to all. Our Under16 football team played their first championship match on St Patrick’s morning last away against Tramore. In what was an exciting game of football played between two evenly matched teams the score at full time was level. This was a solid start to our championship and hopefully this will be a result that can be improved upon as the championship goes on. Congratulations from everyone in the club must go to brother and sister combination Dara and Caoimhe McGrath who were recently shortlisted to the final 12 in the prestigious Pat Noctor Awards for their outstanding achievements in GAA over the past 12 months. Well done to both indeed who did not win the overall award on the night but represented the club with pride. Suzanne Gough is our Membership Officer and all Coaches of Juvenile Teams are asked to return all membership forms and fees as soon as possible and prior to a deadline of March 27th to Suzanne. Players who have not paid their membership and who may be injured during a match will not be covered by player injury scheme. Your cooperation in this matter would be appreciated. Our under 8 team are heading to a blitz this Saturday morning in Carriganore and we all hope they have a fantastic day out. Under eleven hurling training continues this Friday night between 6 and 7 pm. New members are always welcome and membership forms will be handed out on the night. The Town and Country Leagues for this group of players starts in a few weeks time and hopefully all the training that this group are doing will pay off when they begin. Training for U6, U8 and U10 will recommence on Friday 8th of April. The first blitz for U8 & U10 will take place in Abbeyside on Saturday 9th of April, with our U12 girls travelling to Bushy Park on Saturday 16th of April. Training continues every Tuesday evening from 6.30 to 7.30 for U16/U14 girls. All intending players for 2016 are requested to attend. Membership officer Elena Carmody will be collecting membership for 2016 in the coming weeks. This week's photo comes from 2012 and shows young Abbeyside camogie players and mentors lining up at the Burgery for the St. Patrick's Day Parade through the streets of the village and Dungarvan. Since its foundation the club has gone from strength to strength, culminating in its first county title success last year. Our club took part in the annual St. Patrick's Day Parade yesterday. A large number of juvenile and senior players marched behind the club banner as it made it's way through the streets of Abbeyside and Dungarvan. Thanks to all who organised the event and to the adults who were on hand to look after the children. Below are some photos of the parade. Thanks to Audrey Hallahan for these great shots. 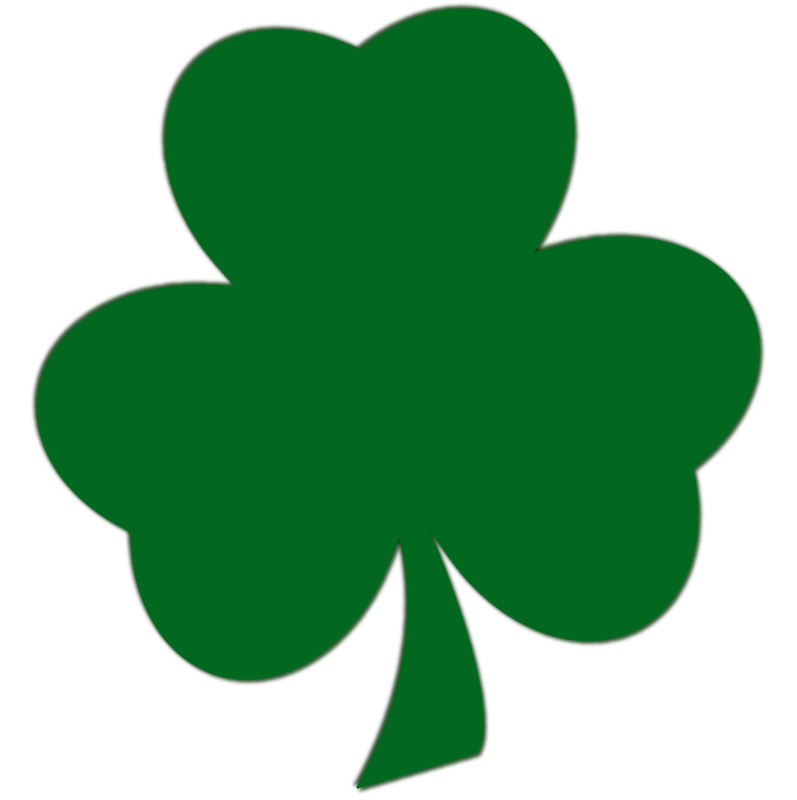 Wishing all members of CLG Dún na Mainistreach / Baile na Cúirte, at home and abroad, a very happy St. Patrick's Day. Our ever popular Jack the Joker fundraiser continues this Sunday night in Alice O’Connors where the jackpot is €3,400 as on Sunday night last Sheila Lonergan was drawn out of the drum and chose card number 18, which when turned was not the Joker though she did win €50. Deirdre Wade and Christy Phelan won €25 each. As well as our group of ticket sellers tickets can be purchased from Convenience Store Ballinroad, Village Flowers, Spar, Mousies Takeaway, Minnies Bar and Crotty’s Corner Bar. On Saturday last our Senior Footballers got their Phelan Cup campaign off to a good start with a win over Gaultier in Carriganore. TEAM: P. COLLINS, C. McCARTHY, E. BERGIN, D. HENLEY, P. LYNCH, S. O’HARE, D. COLLINS, C. PRUNTY, J. O’MAHONY, P. HURNEY, M. FIVES, M. O’HALLORAN, S. O’DONOVAN, J. O’BRIEN, M. MAHER. SUBS: S. CLIFFE, E. KIELY, L. HURNEY, C. O’DWYER, C. MOLONEY. This Saturday we play The Nire at 5:30 pm in Ballymacarbery. On behalf of all in the club we would like to wish Brian Looby a speedy recovery from the unfortunate facial injury he picked up last week. Because of this injury Brian is going to miss out on a lot of matches with the club in both hurling and football but we hope to see him back playing in the coming months. Our club bingo will continue this Sunday night in the the CBS Hall with a jackpot of €1100. Our Under16 Football team play their first championship game away to Tramore on St Patrick’s Day morning in Tramore. This game is a re fixture as when they were due to play two weeks ago it was postponed due to a water logged field in Tramore. Our underage section will be participating in this year's Dungarvan St Patrick’s Day Parade. We are inviting all our underage players to walk with our group in the Parade. We will be assembling at Garveys Service Station on Coolagh Road at 2.30pm. All players should wear their club colours and bring their hurleys and helmets. We will follow the route of the parade until we reach the traffic lights midway up O'Connell Street (Walsh’s Spar). At this point we will turn right, heading towards Dunnes & Aldi. Children can be picked up at this location @ approx 4pm. All are welcome to participate. We held a fundraising sponsored walk and run on Sunday evening last in the Ballinacourty area along with the camogie club in aid of being a host club for Féile 2016. Luck was on our side on the evening as the weather was beautiful for walking and as a result we had a massive turnout. The juvenile club would like to thank all those who helped on the evening in any small way including stewards on the roads to make sure safety was a priority. We would also like to thank most sincerely anybody who took part in the walk or run and anybody who dipped their hands in their pockets and sponsored those partaking. Well done to all. We took on Gaultir in the second round of the Minor Football Championship on Sunday morning last in Gaultir. On the morning we played some fabulous football at times and came away with a comfortable enough victory. The next game for this group of players is this Sunday morning at home to Rathgormack at 11.30. On Saturday morning last our Under 10 team took part in a hurling blitz in Carriganore. This was our first action of the year in this grade and all the boys that took part acquitted themselves well and had a very enjoyable day. To top off a busy weekend for this group they played on Sunday morning in football against Clashmore and again done well. Also on Saturday morning last our Under13 football team played the first round of their championship against a very strong St Pat’s side. On the morning St Pat’s proved to be the better team and came away with victory. Our Under 14 football team play their second game of the Under 14 championship tonight (Wednesday) against Tramore in The Burgery at 7pm. We wish all involved well. Training for this group continues on a weekly basis on Monday and Thursday nights. This week's photo shows Ballinacourty captain, Seán O'Hare raising the Conway Cup aloft following his team's 0-6 to 0-5 victory over Stradbally in the 2011 County Senior Football Championship Final played at Fraher Field. In appalling weather conditions consisting of driving rain and gale force winds we led by 0-6 to 0-0 at half time before conceding 0-5 in the second half. Victory here secured our first senior title since 2007. Our ever popular Jack the Joker fundraiser continues this Sunday night in Alice O’Connors where the jackpot is €3,200 as on Sunday night last Bernard Gorman was drawn out of the drum and chose card number 10, which when turned was not the Joker though he did win €50. Jim Egan and the Liam Briggs won €25 each. As well as our group of ticket sellers tickets can be purchased from Convenience Store Ballinroad, Village Flowers, Spar, Mousies Takeaway, Minnies Bar and Crotty’s Corner Bar. There was a huge crowd present in MInnies Bar on Sunday night for the now Annual Abbeyside Sports Awards. On the night Patrick Hurney and Conor Prunty were honoured for being chosen as Footballer of the Year and Underage Footballer of the Year respectively. Also honoured on the night were Liam Enright, Joe Power, Johnny Burns and Eddie Cashin. There was also a very moving and deserving tribute to the late Michael Collins in recognition of his lifetime of work in the club. A number of speakers spoke fondly and at times humorously of their memories of Mick’s involvement in the club, before a presentation was made to Vera Collins. We would like to compliment Bob O’Brien and also Pat and Paddy O’Brien of Minnies Bar for putting together such a wonderful night. On behalf of all in the club we would like to congratulate Conor Prunty who won a Freshers All Ireland Colleges Hurling medal last week. Conor was centre back on the CIT team that defeated DCU in the All Ireland final in Cork last Wednesday. Our club bingo will continue this Sunday night in the the CBS Hall with a jackpot of €1050. Our minor football team play their second game in the county championship this Sunday morning away to Gaultir. This should prove a very tough test for the lads involved and hopefully they will come away with another victory. Our Under14 football team kicked off their championship on Sunday morning last in Ballygunner field against a very strong Gaultir team. The home team looked sharper throughout and in the end came away with a fairly comfortable victory. However our lads battled hard throughout and at the end of the game the score line was Gaultir 3-5 Ballinacourty 1-3. Training for this group continues every Monday and Thursday. Our Under16 football team play their first championship game away to Tramore on St Patrick’s Day morning in Tramore. This game is a re fixture as when they were due to play last week it was postponed due to a water logged field in Tramore. We intend to hold a sponsored walk and run this Sunday the 13th March at 5.30 pm in aid of Feile 2016. Everyone is welcome to participate including young and old, so grab your trainers and put this date in your diary and help raise a few euro to host this prestigious event in June. The walk and run will take place around the Clonea - Ballinacourty area and if you would like to participate please ask any of the juvenile commitee for details regarding meeting times etc. We will be joined in this event by the juvenile camogie club. Our underage section will be participating in this year's Dungarvan St Patrick s Day Parade. We are inviting all our underage players to walk with our group in the Parade. We will be assembling at Garveys Service Station on Coolagh Road at 2.30pm. All players should wear their club colours and bring their hurleys and helmets. We will follow the route of the parade until we reach the traffic lights mid-way up O'Connell Street (Walsh’s Spar). At this point we will turn right, heading towards Dunnes & Aldi. Children can be picked up at this location @ approx 4pm. All are welcome to participate. Our underage training sessions on Saturday mornings from 10.30am to 11.30am are proving to be a great success and we welcome back all previous players and say a Céad Míle Fáilte to all our newcomers. Thank you to all the parents who have returned the membership forms so far and we respectfully request any outstanding forms are to be returned this Saturday to allow us to register all players with Croke Park (for insurance purposes). Hurleys, Helmets & Junior Gum Shields can be purchased from our Equipment Officer, Séan Fischer, on Saturday's and are very competitively priced. 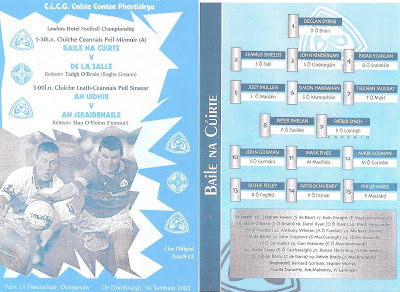 This week's photo shows the official programme cover and the Ballinacourty Minor Football panel that beat De La Salle 2-8 to 2-3 in the 2003 County 'A' Final played in Fraher Field as a curtain raiser to the senior decider. 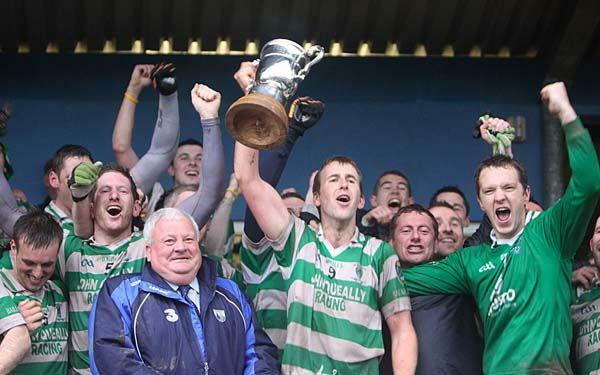 Victory here secured a three in a row of County Minor 'A' Football titles. Our ever popular Jack the Joker fundraiser continues this Monday night in Alice O’Connors where the jackpot is €3,000 as on Sunday night last Eddie O’Halloran was drawn out of the drum and chose card number 19, which when turned was not the Joker though he did win €50. Anthony Whelan and the Morning Club won €25 each. As well as our group of ticket sellers tickets can be purchased from Convenience Store Ballinroad, Village Flowers, Spar, Mousies Takeaway, Minnies Bar and Crotty’s Corner Bar. Our under 21 footballers made the trip to Carriganore last Monday night to take on The Nire in the first round of the Western Championship. At the end of a very competitive game of football we emerged victorious and advance to the Semi Finals of the championship. This Sunday night at 8:30 pm in Minnies Bar the Annual Abbeyside Sports Awards will once again be presented to those who have made a valuable contribution to the various sporting bodies in our community. The O’Brien family have generously sponsored these awards for a number of years now and on Sunday night a number of members of our club will be presented with awards. Also on the night there will be a tribute to the late Michael Collins and for this reason we would ask as many club members as possible to call along on the night and show your support for these awards. On Sunday last the Waterford senior footballers recorded their first win in the Allianz National Football league with a comprehensive victory over Carlow. Stephen Enright, Brian Looby, Conor Prunty, Patrick Hurney and Michael O’Halloran all played their part in the victory whilst Eoin Bergin and James O’Mahony are also on the panel. We wish them the very best of luck ahead of this Saturday night’s game against Wexford in Fraher Field. Our club bingo will continue this Sunday night in the CBS Hall with a jackpot of €1000. Camogie season is up and running with all age groups back in competitive action in the next few weeks. U16s will play their first game of the season on the 4th April, with U14s out the following week on the 11th. Training continues every Tuesday evening from 7:00 to 8:00 for U14/U16. The U14/U16s played a challenge match on Saturday last in Abbeyside the girls put in a great performance in very heavy underfoot conditions and it really showed that these girls had been training all winter. U12s return to training on Saturday 5th at 4:00pm until 5:00pm all girls who intend to play this year are asked to attend. As always like any voluntary club we are always looking for people to get involved if you think you would be interested contact any of the committee members. Our sponsored walk will take place on Sunday 13th March, this walk is to raise money for our up and coming Feile weekend. Cards can be got from Ritchie or Eddie.